Although the Texas legislature and Governor Gregg Abbott agree that Carrizo cane (Arundo donax) along the Rio Grande needs to be eradicated for security reasons, the state legislature has still not funded the effort. Abbott's office will make $190,000 available from a federal grant, which will allow the treatment of about 700 acres. Learn more. "Barrier screens with different mesh sizes were evaluated for their ability to exclude the brown marmorated stink bug (Halyomorpha halys), provide entry to beneficial species, and produce high marketable yield in organically grown bell peppers. Fine-mesh plots were determined to effectively exclude insects and reduce stink bug injury on peppers. For areas with smaller stink bug populations, lighter colored, and/or wider meshes were recommended, while finer meshes were found appropriate for areas with higher stink bug pressure." Learn more. "Garlic mustard (Alliaria petiolata), an invasive plant affecting forested areas in the Midwestern and Eastern United States, secretes a chemical called sinigrin into soil to deter the growth of other plants and decrease competition. Researchers have found that sinigrin concentrations decrease as garlic mustard populations age, demonstrating evolutionary change due to ecological processes. They predict that, over decades, garlic mustard will decline and reach a balance with native species that re-colonize invaded areas." Learn more. The two countries with the largest potential cost from damages caused by invasive species, the U.S. and China, are also the countries that pose the greatest threat to other nations, according to a team of international researchers. 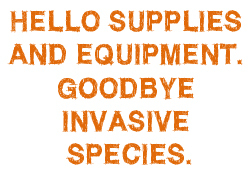 Invasive species will have a proportionately larger effect on smaller, developing nations. Learn more. "Bighead carp [Hypophthalmichthys nobilis] and silver carp [H. molitrix] are species of invasive Asian carp that threaten the Great Lakes. Adding carbon dioxide gas to water, a process similar to making carbonated soda water, could help control the movement and behavior of invasive carp in the Great Lakes basin, according to a recent study. Both carp species avoided carbon dioxide-infused water in a research pond." Learn more. Some invasive plants reproduce by seed, some by growing vegetatively by producing clones, and some by both methods. A theoretical study proposes that reproducing clonally can make a species invasive when its clones die and improve the soil, making it possible for future clones to survive and thus allowing the plant to spread. Besides this "grow and die" strategy, clonal growth can also help the plant adapt. Learn more. New research has determined that a type of algae called "rock snot" that was thought to be an invasive species in the Northeast is actually native to the northern United States. The aquatic algae, Didymosphenia geminate, has caused massive blooms in some U.S. rivers. Next month, Vermont officials will lift its ban on the use of felt-soled waders, instituted to help prevent the spread of the algae, apparently the first state to do so. Learn more. Fijian bees are very effective in pollinating non-native invasive species. Unfortunately, this increases the rate at which invasives can spread and makes Fiji more vulnerable to exotic plant species. Learn more. The southeastern coast of the island of Cyprus is now home to the lionfish (Pterois miles), a predatory fish originally from the Indo-Pacific and the Red Sea that has invaded the Caribbean and the western Atlantic. Apparently rising sea surface temperatures are allowing it to survive where it once could not. In addition, the widening and deepening of the Suez Canal may provide an opportunity for more lionfish to cross into the Mediterranean Sea. Learn more. One way to lower the risk of importing new invasive species is to regulate trade with ceratin countries. A New Zealand study found that because different countries have different degrees of regulation and political stability, the threat they pose as sources of invasives as trading partners also varies. Those with the poorest regulations and greatest instability pose the highest threat, and selecting trading partners on this basis can reduce the number of invasive species entering the country by nine times. Learn more. If you would like to highlight a successful invasive species project or nominate a special person to be highlighted in an upcoming iWire, please send the details to iwire@texasinvasives.org. 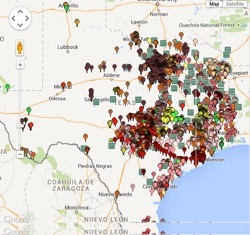 Invaders of Texas Citizen Scientist Observations 2005-2014.